This Roasted Tomato & Red Pepper Soup is light but packed full of flavour. It is perfect for a light lunch and even better served with some crusty bread! As you may already know, I am incredibly fussy with many things; soup being one of them. When I was a child I had a bad experience with tinned soup and since then I have decided it is much safer to make soup myself! 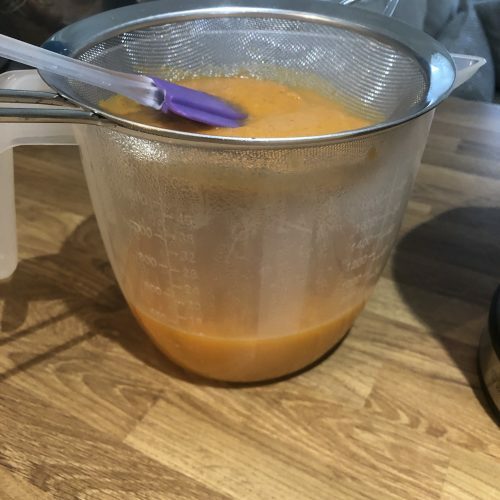 I have a soup maker which makes the whole process of making soup so much easier and quicker; if only for the fact it blends the soup as well as cooking it which means less washing up! It also means I can use the base ingredients and quantities to come up with lots of different soups depending on what vegetables I have in the fridge that need using. This Roasted Tomato & Red Pepper Soup is a staple in my house. I roast the vegetables to give them more flavour in the soup. This really is a worth while step that I wouldn’t recommend skipping! This recipe will make three generous portions which keep well in the fridge for a couple of days or can be frozen. If frozen, you can either defrost the soup or heat it from frozen. What is even better about this soup is each portion is only roughly 150 calories which makes it fantastic for those people trying to be healthier in the new year; or for people who just like tasty soup! 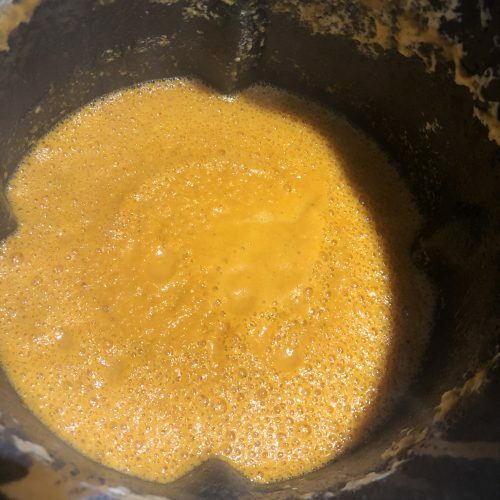 If you prefer a silky smooth soup, I recommend passing the soup through a sieve. This collects all of the tomato seeds and skin. I find this easier than removing the seeds and skin before you roast them. You can always miss this stage if you don’t mind the odd tomato seed! For an added treat, grate some Parmesan on baking tray in a small pile and melt in the oven for 5 minutes until slightly golden. Remove from the baking tray while still warm and add to the top of the soup. Heat the oven to 180ºC (fan assisted 200ºC non fan). 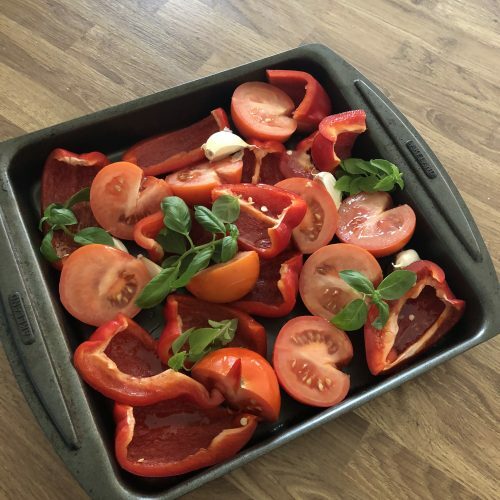 Chop up the peppers and tomatoes and add to an oven proof dish along with the garlic cloves, salt, pepper and basil. Lightly spray with oil and roast in the oven for 30 minutes. If you are using a soup maker, add the roasted vegetables to the soup maker making sure you remove the skins from the garlic cloves. Add the stock and milk and set to smooth where it will cook for around 20 minutes. If you don't have a soup maker, add the roasted vegetables to a large pan along with the stock and milk. Bring to the boil and then let simmer for 15-20 minutes before blending the soup. Whichever method you use, before serving pass the soup through a fine sieve. This removes any tomato seeds and skin. Reheat the soup for a couple of minutes in a pan to make sure it is piping hot before serving. This entry was posted in Soup on January 5, 2017 by Curly. I’m very tempted by a soup maker. I make so many soups that I know it would be something I’d really use. This sounds delicious! What a lovely color! Roasted veggies always add beautiful flavor. I do love an easy soup recipe! I love the sound of this! Tomato soup is my favourite and I love roasted peppers too! Gosh this really does look very good. 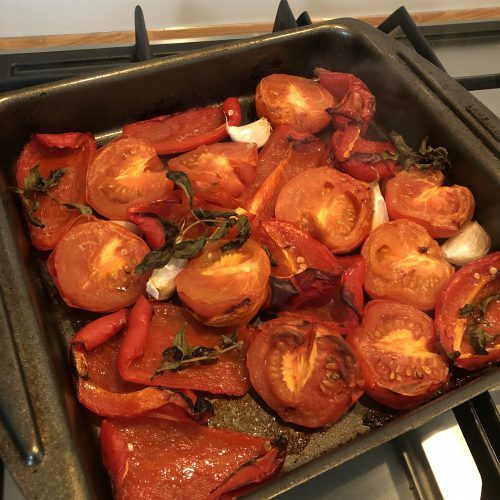 I am a massive fan of roasted tomatoes. Good tomatoes are wondrous things. I’m loving the sound of your soup maker too! 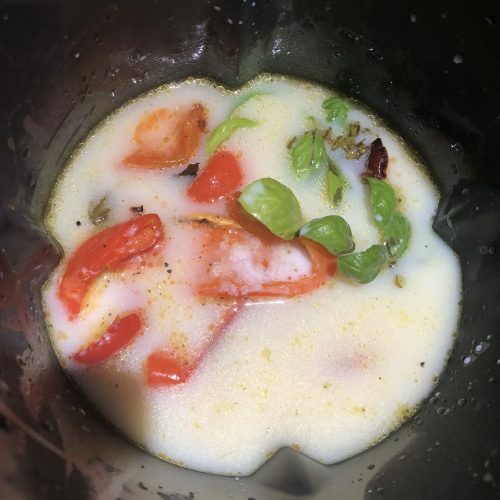 Thanks Jenny, it is such a quick and easy way to make soup. Your soup sounds and looks delicious Cat! I love how much more intense roasted veggies taste, without compare! One to make! Pingback: 4 Brilliant Soups and Stews and #CookBlogShare Week 11 - Apply to Face Blog.